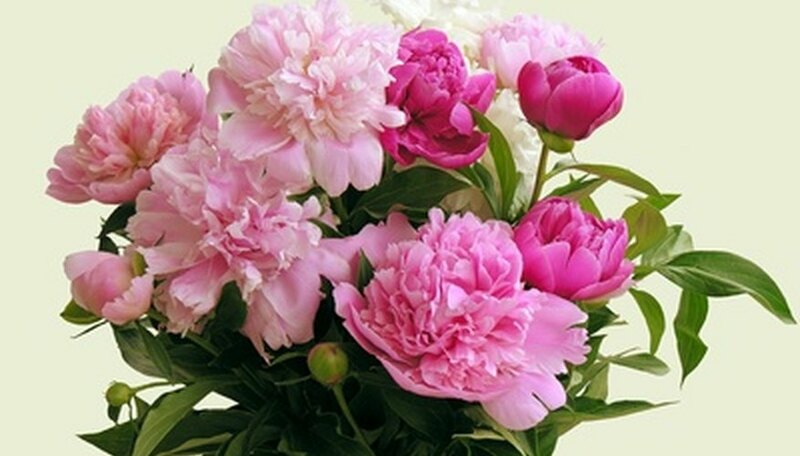 Herbaceous peonies are the peonies that resemble small bushes with beautiful, colorful white, pink or magenta blooms in the late spring and early summer. Peonies are a longtime favorite of gardeners in USDA zones 2 through 8. Many California gardeners yearn to add peonies to their landscape, but believe because peonies need to have a cold dormant period, they cannot successfully grow peonies. There are some steps you can take to help your peonies bloom and grow in California. Choose peony varieties that are early blooming, single or semi-double petal. Some good warmer climate peony varieties include Festiva Maxima, Charlie's White, Do Tell and Kansas. Select a location in your landscaping that will provide 6 hours of sun per day, but will provide shade during the heat of the day during the summer. Try not to chose a location that is under a tree, though, because the tree roots will compete with your peony for nutrition and water. The soil should be well-draining and, preferably, rich and loamy. Prepare the soil area where you plan to plant your peony by digging the soil 12 to 18 inches deep. Break up any clots and mix a good amount of compost or organic material in with the garden soil. This is all the fertilizing your peony will need. Plant your peony so the roots are no more than one inch below the soil surface. The eye of your peony should be just below, or slightly above, the soil surface. Peonies in any zone do not like to planted deep and will not bloom if they are planted too deep. Water your peony as soon as you have planted it to settle the soil. Spring rains should be sufficient to keep the soil your peony grows in moist enough, otherwise water your peony every 10 to 14 days. Be sure to continue watering to keep the soil moist during the hot summer months of California. Giving your peony enough water throughout the summer, by a good soaking every few days, is key to successfully growing peonies in California. Cut back the foliage to the base when it dies in the late summer. Peony trees are a good alternative to herbaceous peonies for California gardeners.